David Cameron's EU negotiations were a "theatrical sideshow" aimed at appeasing Conservative MPs, Labour leader Jeremy Corbyn has said. Mr Corbyn said the PM should have focused on issues like cyber crime, fair trade and the refugee crisis. And he claimed the "influence of Tory Party funders" could be seen in protections for the City of London. The PM told MPs leaving the European Union "could hurt working people for years to come". 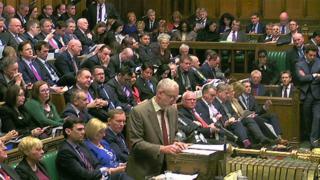 Responding to Mr Cameron's Commons statement on the reform deal that has triggered the UK's EU referendum on June 23, Mr Corbyn said Labour was "overwhelmingly for staying in". EU membership brought jobs and investment, he said. Turning to the reform package, The Labour leader backed a so-called "red card system" allowing national Parliaments to club together and veto EU law, saying this had previously been proposed by his party. But he said the majority of the PM's negotiations had not been about the future of Europe. Highlighting what he said were "serious, pressing issues" that Mr Cameron should have focused on, he said welfare reforms should have addressed low pay in the UK, the undercutting of wages and the "grotesque" exploitation of migrant workers. The prime minister said he disagreed with Mr Corbyn "on many things" but said they agreed that Britain should be part of Europe. His draft deal, he said, implemented "almost every single pledge" on Europe that had been in Labour's general election manifesto.